I know it has been a lot of Rugby related posts from me recently, but here is one more. So, my predictions here and here were a bit off and of course there’s still the matter of the winner to be decided this weekend. So far, I got the Australia v Ireland match and Wales v Ireland match results wrong. Apart from that things have been pretty good. Personally, the betting hasn’t been very productive from me as yet. But, I’m keeping afloat thanks to some side bets I made with friends. But, I’ve decided not to do that anymore and keep my betting online as some people get very emotional when their team lose. Anyway, if the All Blacks deliver on Sunday I would come out with a bit of dough. Moving along to the point of this post, the IRB announced its nominations for the player of the year award. The nominees are Thierry Dusautoir (France), Piri Weepu (NZ), Jerome Kaino (NZ), Ma’a Nonu (NZ), David Pocock (Aus) and Will Genia (Aus). There a lot of class in this lot. Genia has been an instrumental playmaker for the Wallabies while Pocock has been their key man at the breakdown. Pocock was nominated last year as well and he is only 23 years of age. But he is not quite as good as McCaw, yet. So I don’t think it is his time yet. Genia is also around the same age, and if an Aussie is to win this, it would be him. To be honest, I haven’t seen Dusautoir stand out too much. Yes, he is a good player. But not quite player of the year. He did have some very good outings tho, especially during the six nations. Coming to the All Blacks, Weepu has been the first choice scrum half and backup kicker for Dan Carter. He has really brought up all the aspects of his game from a few years ago. Nicknamed ‘Mr. Fix it’, he is the man to turn to to get you out of a jam. Then there is Nonu – the dreaded hulk in mid field. His ability to break through the opposition defense along with his solid defense have guaranteed that Graham Henry picks him for any important outing. He is the closest thing to Tana Umaga in the All Black unit – and that certainly is saying a lot. As good as these two have been, the man that has stood out for the Blackness is Jerome Kaino. He puts in a huge amount of work at the breakdowns, and come out with the ball on many an occasion. His tackling has been brilliant and has been consistent throughout the 80 minutes. He has been a stalwart in the All Blacks RWC campaign. 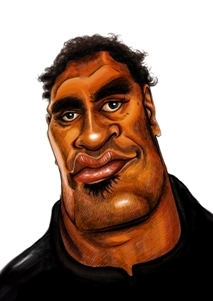 The only person that I see capable of challenging Kaino is Genia. Come Sunday, if the All Blacks lift the Webb Ellis cup, it would be hard to imagine anyone but Kaino walking away with this award. I’d go with Kaino too, but surely Israel Dagg should be in the running? He’s brilliant whenever he gets the ball. Dagg definitely stands out, but since Mils is still around and is so reliable has not been able to cement his place in the team. He will surely be in the running in the coming years provided he keeps improving. Guess the French skipper landing it had something to do with that final too. By the way, Mils is NOT around anymore. He called it quits, and is headed this way to play club rugby! I’m wondering whether I should go see some matches.